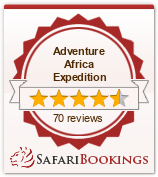 3 DAYS MASAI MARA CAMPING SAFARIS. Day 1 Nairobi - Masai Mara. Pick up from your hotel at 0730hrs in the morning after the breakfast then depart for a journey south through the floor of the Great Rift Valley. Stop at Narok town for Picnic lunch. After lunch proceed to Masai Mara and this normally takes 3 hours to get there, some section of the road are bumpy but it gives you just a taste of Adventure Africa Expedition, upon arrival check in the Camp and there after go for the late afternoon game viewing until 1830hrs. Then return to the camp for dinner and overnight. Day 2 Masai Mara Full day. On this day you will wake up at 0600hrs have your full breakfast, then our cook will have prepared for you fresh packed food since the whole day will be spent in exploring this amazing game reserve which has become the world 7th wonders. This day will take you all the way to the Mara River where the great migration normally takes place where you will witness millions of wildebeest cross the Crocodile invested river, you will also have an opportunity to take the photo at the border between Masai Mara and Serengeti since both reserves share the common border. Spent the whole day in search of the Big Five. Then after exploring the reserve start driving back to the camp for dinner and overnight in the Camp. Day 3 Masai Mara - Nairobi. On this day you will have a wake up call as at 0600am and have just a cup of hot coffee and then proceed for the early morning game drive, this early morning game drive will give you an opportunity to see the early morning hunt and the Big five making kills. Then return to the camp for the main breakfast as you prepare to check out the Park. On this morning you will also have an opportunity to visit the Masai Village and be entertained by the Masai Dance, you will also have an opportunity to buy curios and other items from the village at a reduced cost. Then leave Mara and head to Nairobi but stop at Narok for lunch, after lunch proceed to Nairobi arriving late afternoon with a drop off to your hotel.